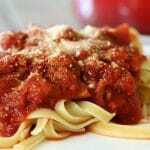 This easy homemade turkey spaghetti sauce can be made in the slow cooker or in a dutch oven and is rich and chunky with mushrooms, onions, turkey and sausage. 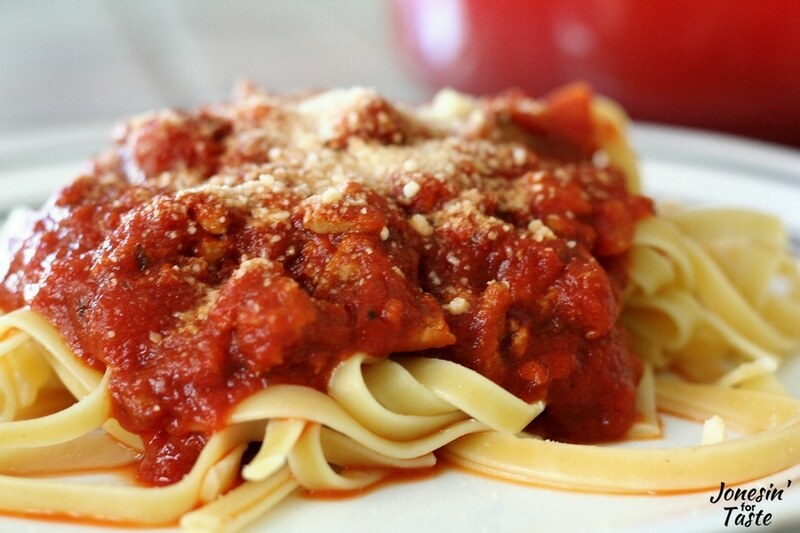 This spaghetti sauce is my ultimate comfort food. It’s the dish I always asked for on my birthday growing up. 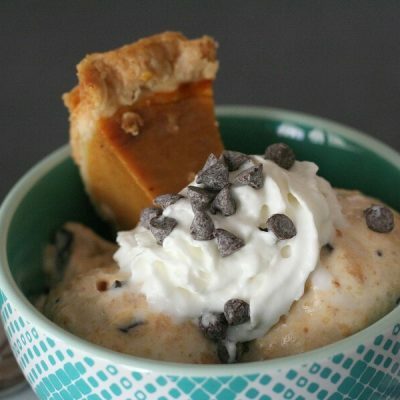 I can tell when I’m feeling stressed out or overwhelmed because this is the dish I crave. My mom would have this simmering on the stove and the whole house would smell amazing as it cooked. What can I use spaghetti sauce for? I love how much sauce this recipe makes. There is plenty of sauce to have for spaghetti one night and then to make lasagna another night. I think this spaghetti sauce is especially good with my goat cheese lasagna. The goat cheese is so strong so this strong sauce pairs really well with it. Not sure your kids will like a new flavor like goat cheese? Check out my resource guide on How to teach your children to become world food explorers for tips on introducing them to new foods. Can I make spaghetti sauce in the slow cooker or Instant Pot? Of course during the summer it’s way too hot to have a pot of sauce simmering on the stove for hours. When it’s too hot to cook the spaghetti sauce on the stove I use my slow cooker or Instant Pot. To make this recipe in the slow cooker, saute the garlic, mushrooms, and onions and brown the meats in a pan before adding them to the slow cooker following the instructions below. Add the remaining ingredients and cook on low for 4-5 hours. It tastes just as good and it contains the heat a lot better. Besides not having to watch over a simmering pot it’s also nice to use the slow cooker because it can cook longer and there’s no need to worry about it burning from being too hot. Brilliant! To use the Instant Pot to make spaghetti sauce, use the saute function to saute the mushrooms and onions with olive oil for 4-5 minutes. Remove those and brown the meats until they are no longer pink. Add the remaining ingredients, put on the lid, set the valve to sealing, and cook on manual pressure HIGH for 10 minutes. Allow the pressure to release naturally for at least 5 minutes before moving the valve to venting. Can I take just a second here and talk about my ladle? 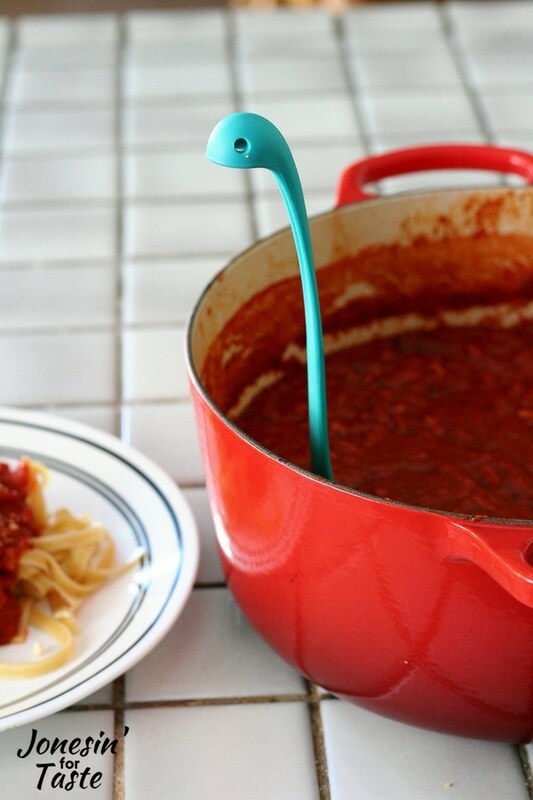 I love this Nessie Soup Ladle! It’s so fun and it’s actually a great size because it’s not quite as gigantic as my regular ladle. And it’s a Loch Ness Monster in my favorite color! Okay, rant over! I think the reason I love this sauce besides the fact that it’s my mom’s is that it is so meaty! The ground turkey and mushrooms keep it light but there’s still a lot to it so you feel full eating less. We always top it with a hearty sprinkle of parmesan cheese. What to serve with homemade spaghetti? 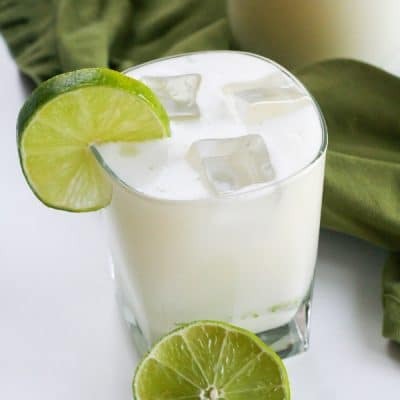 We like to pair this with a nice salad and bread. 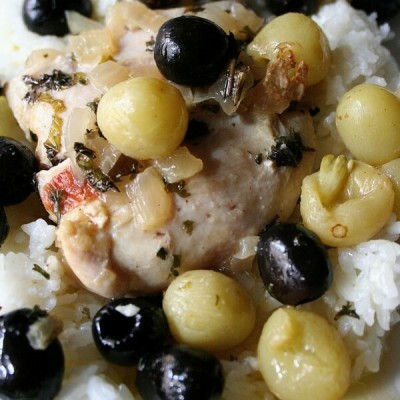 In a large pot like a dutch oven, add 1 Tbsp olive oil to pan. Add both the meats and cook until no longer pink, breaking up the meat into small pieces. Remove meats from pan. To the same pan add the remaining 2 Tbsp of olive oil and sauté garlic, onion, and mushrooms for 4-5 minutes until translucent. Return the meat mixture to the dutch oven with the mushroom and onion mixture. Then mix in tomato paste to mixture. Add tomato sauce, basil, oregano, and bay leaves and mix thoroughly. Simmer for 3-4 hours on low stirring occasionally. 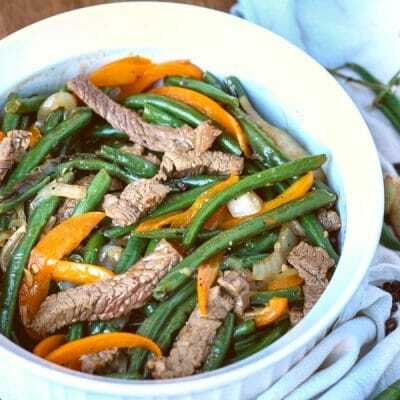 Before serving pull out bay leaves they have an extremely strong flavor and biting into one is a super nasty surprise. Use the saute function, add 1 Tbsp of olive oil and brown the meats until they are no longer pink. Remove the meats from the insert. Saute the garlic, mushrooms and onions with 2 Tbsp olive oil for 4-5 minutes. Return the meats to the pan. Add the tomato paste and mix thoroughly. Add the remaining ingredients and mix well. Put on the lid, set the valve to sealing, and cook on manual pressure HIGH for 10 minutes. Allow the pressure to release naturally for at least 5 minutes before moving the valve to venting. Follow the above steps for cooking on the stove. 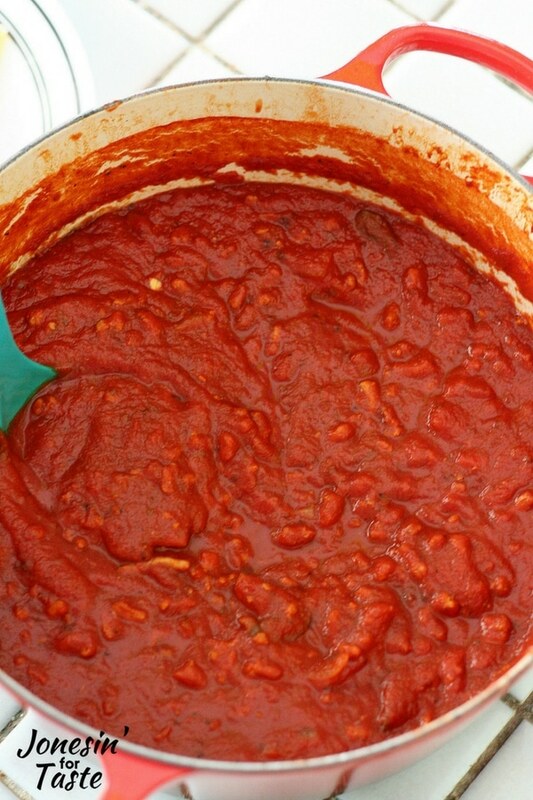 Once you have mixed the tomato paste with the meat pour the mixture into your slow cooker. Add the remaining ingredients and mix well. 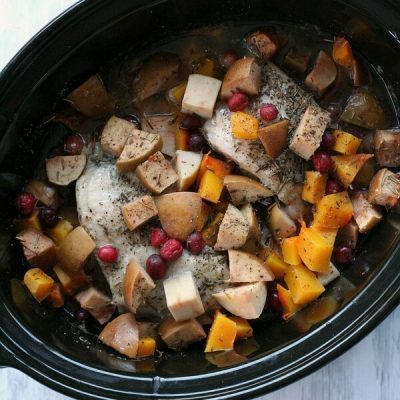 Set the slow cooker on low and cook for 4-5 hours. You can substitute ground beef for ground turkey, if preferred. You can use either hot Italian sausage or sweet. You can use cooked ground turkey and sausage to skip the browning meat step. Add the cooked meats to the pan after saute the garlic, mushrooms, and onions.